My husband and I host a themed Christmas party every year. After receiving a stuffed squirrel from a friend’s parents (long story) we decided that this year’s theme should be National Lampoon’s Christmas Vacation. It’s a classic holiday comedy and an easy party theme. We held a costume contest, a Frank Shirley rant competition and provided cocktails and dessert. It was a great time, with lots of laughter, tons of food, and maybe a few too many hot buttered rum drinks. I scoured the internet looking for Christmas Vacation inspired desserts and found nothing. I spent a few hours brainstorming and came up with what you see below. 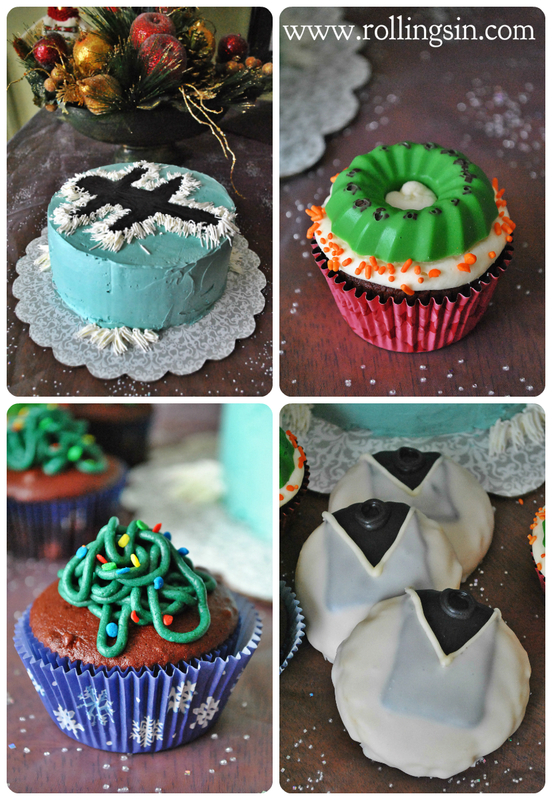 The Tangled Lights cupcakes are from i am baker, but the other three desserts are Rolling Sin – Sweets After Dark originals. How exciting! 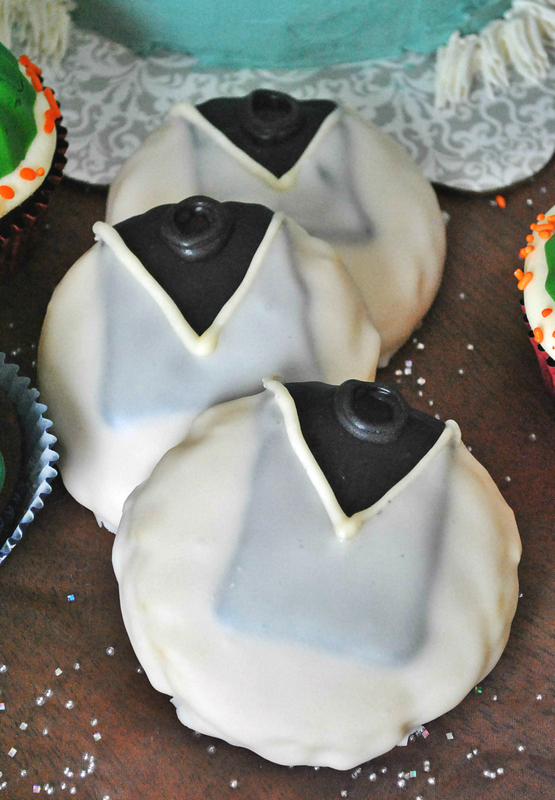 Make a batch of Cousin Eddie Cookies for your next get together to show off your baking skills and sense of humor at the same time! Amazingly soft, bakery style sugar cookies with chocolate dickies and a powdered sugar sweater glaze. The buttery sweet dough emulsion is the secret to fabulous sugar cookies. 2. In a medium bowl, cream together the butter and sugar. Stir in the eggs, buttery sweet dough emulsion and vanilla. Combine the flour, baking powder and salt, stir into the creamed mixture until dough comes together. Roll dough into walnut sized balls and place them on a cookie sheet about 2 inches apart. Using the bottom of a glass coated in sugar, press down on each cookie to flatten to appox. 1/2″ thickness. 3. Bake cookies 10 to 12 minutes in the preheated oven, until bottom is light brown. Remove from baking sheets to cool on wire racks. 4. Once cookies are cooled, melt black candy melts and put into pastry bag with #4 tip. Pipe and fill in rectangles on the top of each cookie. Then pipe circles at the top of cookie for turtle neck hole. 5. Use melted white chocolate/candy melts in pastry bag to pipe v-shaped neck hole openings on top of dickies. 6. 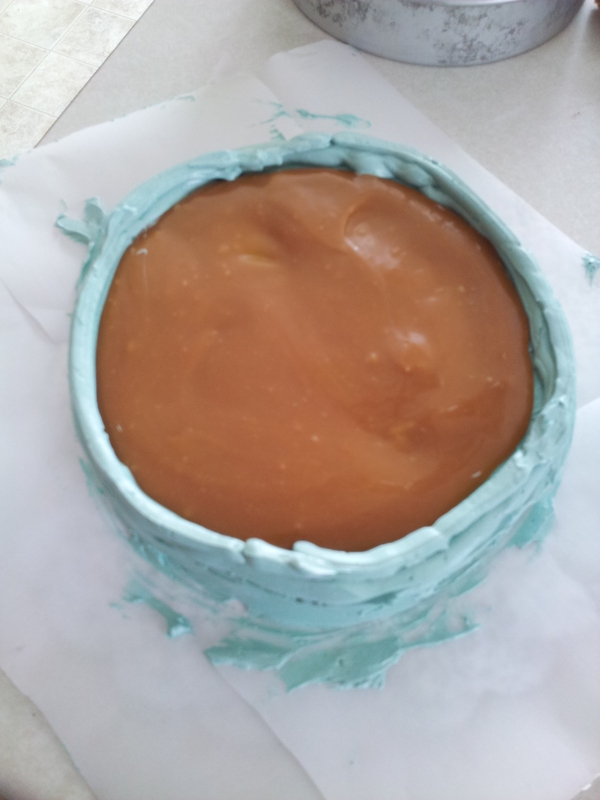 Mix glaze ingredients together, SLOWLY adding milk until desired coating consistency is reached. Spoon glaze onto cookies, careful to keep the glaze on one side of the piped v-neck opening. Let glaze drip a few seconds and then place on cookie rack over parchment paper to catch additional drips. 7. Let dry uncovered overnight. Glaze will harden. Clark: Aunt Bethany, does your cat eat jello? Cousin Eddie: I don’t know about the cat, but *I* sure am enjoying it. 1. Make cupcakes according to box directions, adding two tablespoons of Red Velvet bakery emulsion. 2. 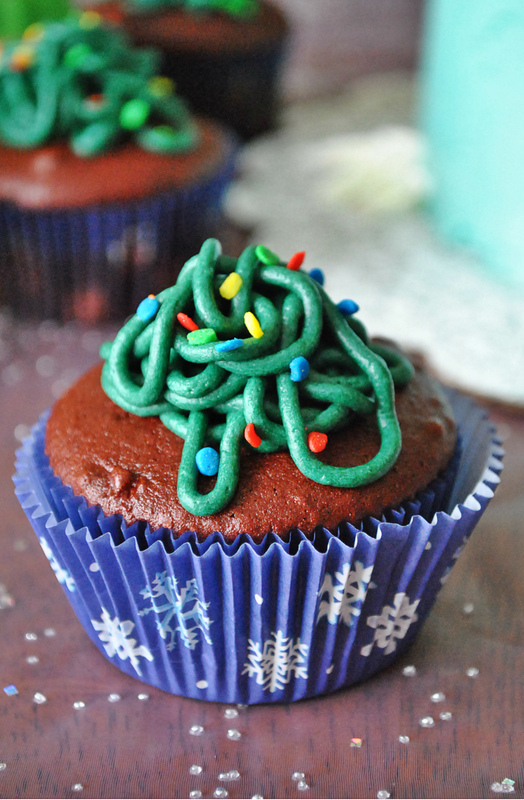 Once cupcakes have cooled, frost flat with cream cheese frosting. 3. Sprinkle brown cocoa nibs or jimmies into the bottom of each mini bundt cavity. 4. Melt green candy melts and pipe or spoon into each cavity, filling about 1/3 of the way up. Chill in the fridge for at least an hour. I had to drop my pan onto the counter to get the molds to release, so make sure the chocolate is set, and don’t be shy about pounding on the pan to get them loose! 5. 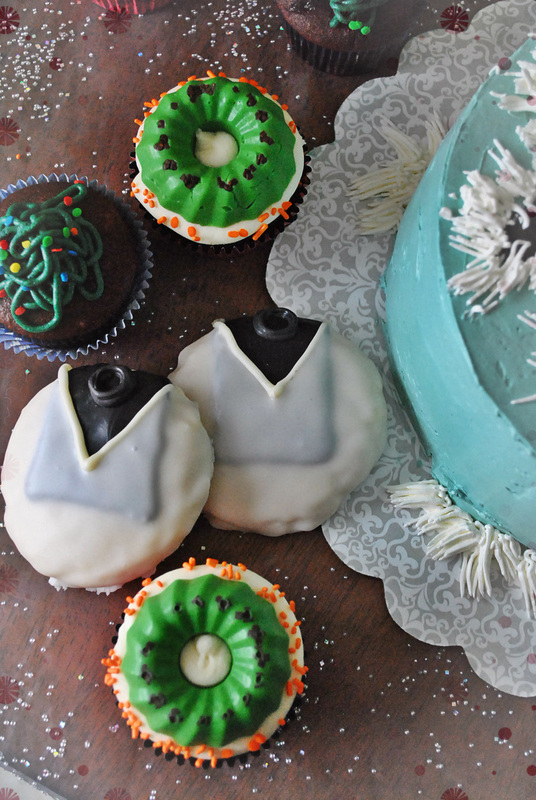 Place Jell-o molds on top of cupcakes and sprinkle edges with orange jimmies. Clark: Unravel these. We need to check every bulb. [Pulls out a huge tangle of lights] Oop. Little knot here, you can work on that. 2. 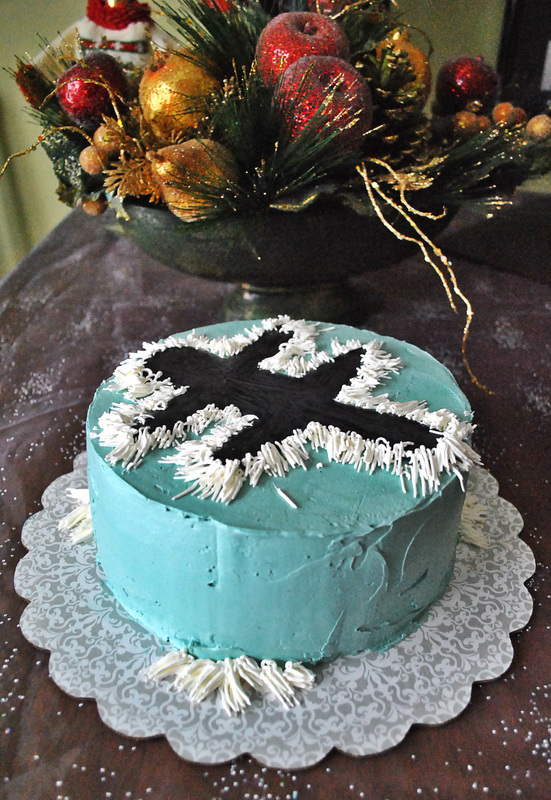 Add forest green gel color to cream cheese frosting until desired shade is reached. Attach #4 tip to pastry bag and fill with frosting. 3. Holding bag 6 inches or so above cupcake, squeeze frosting out of bag and let it drop randomly onto the cupcake, forming a tangled mound. 4. Place or drop a few circle sprinkles in random spots to make it look like light bulbs. Easy peasy! Cousin Eddie: That thing had nine lives, you just spent ’em all. Dark chocolate cake with salted caramel filling and salted caramel frosting. This is the best chocolate cake I’ve ever had, and I’m not a big fan of chocolate cake. I had two people at the party ask repeatedly to share the recipe because they said it was the best chocolate cake they’ve ever had…ever. 1. Preheat oven to 350F degrees. Butter & flour two 8 or 9 inch round cake pans, or use non-stick spray. 2. Sift together the flour, sugar, cocoa powder, baking powder, baking soda, and salt in a medium sized bowl. Set aside. 3. Using a handheld or stand mixer, combine the buttermilk, oil, room temperature eggs, and vanilla in a large bowl. Slowly add the dry ingredients to the wet ingredients with the mixer on low. Add the coffee. The batter will be VERY thin. This is ok.
4. Pour the batter into prepared baking pans and bake for 23-27 minutes or until a toothpick inserted in the center comes out clean. Allow to cool before frosting. 1. Heat granulated sugar in a medium saucepan over medium heat, stirring constantly with a rubber spatula. Sugar will form clumps and eventually melt into a thick brown, amber-colored liquid as you continue to stir. Be careful not to burn. 2. Once sugar is completely melted, immediately add the butter. Be careful in this step because the caramel will bubble rapidly when the butter is added. 3. Stir the butter into the caramel until it is completely melted, about 2-3 minutes. 4. Very slowly, drizzle in 1/2 cup of heavy cream. Since the heavy cream is colder than the caramel, the mixture will rapidly bubble and/or splatter when added. 5. Allow the mixture to boil for 1 minute. It will rise in the pan as it boils. 1. Combine egg whites and sugar in the bowl of your stand mixer, set over a pan of simmering water. Heat the mixture while whisking constantly until sugar is dissolved (to 160F), about 2 minutes. 2. Remove bowl from heat and mix on high until it’s fluffy and holds stiff peaks. With mixer on medium speed, add salt and butter a few pieces at a time. If frosting looks curdled just keep beating, it will come together! After all the butter is added, crank the sucker up to high and beat for an additional 3-5 minutes until everything is smooth, creamy and fluffy. 4. Add teal and a few drops of black gel color to replicate carpet color from Christmas Vacation movie and mix until fluffy. 1. Trace diameter of cake pan onto parchment paper and draw outline of cat. 2. Using melted black candy melts and a small round tip, pipe outline and fill in cat figure. Allow 10 minutes to harden. 6. Using a #233 tip and the reserved white frosting, pipe fur around edges of cat figure and if you have leftover, use as accents around the bottom of the cake. Happy holidays to you and yours! May your family get together this season be filled with lots of love and sweets!